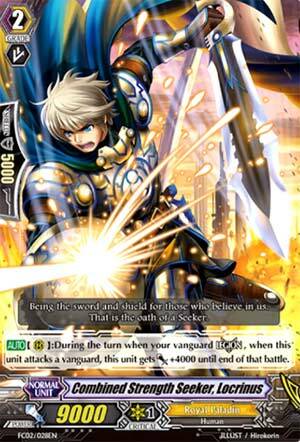 [AUTO](RC):During the turn when your vanguard Legion, when this unit attacks a vanguard, this unit gets [Power]+4000 until end of that battle. Second card of the day is Locrinus! Well, this is easy. On the turn you Legion on up, he gains 4k. At least, when he's a RG anyway (most mates will have RG only skills, with a few exceptions...). So of course, he's meant to make columns on the turn you Legion. 17k is ideal assuming nothing pushes him higher so he can make 21k, but that's basically forcing you to run Toypugal or Marron just to allow this. Not that it's bad, considering Seekers will soon get enough support not to be Especial Counterblast dependent, but it does require more careful planning for his most optimal use. In my mind, he's only really good for Legioning purposes with the Vanguard, and give it December, Brutus will be dropped for the new Seeker ace. Which is by the way rather awesome. Leave him, get the Seeker Trial decks, and just wait for BT16. It's easier. So, yesterday we looked at Brutus, today we look at his Mate, Locrinus. Where Brutus was really good, Locrinus is... Not as good. During the turn that you Legion, when Locrinus attacks, it gets +4000. I admit, I'm not a fan of Locrinus here. In order to keep using it, you need to keep Legioning over and over again. At least it's free. Now, if it gained 4000 attack so long as your vanguard was in Legion, then I'd really enjoy this guy. However, since you can get this guy to the field with Brutus's skill, it's not completely useless at least. Plus, if you legion and use Brutus's Legion skill, then Locrinus gets +7000 for the turn, not counting any boosts or triggers that are drive checked. But, again, what holds it back is that it only works on the turn you Legion. Which makes me sad. It's not bad, but it drags the Legion down a bit.